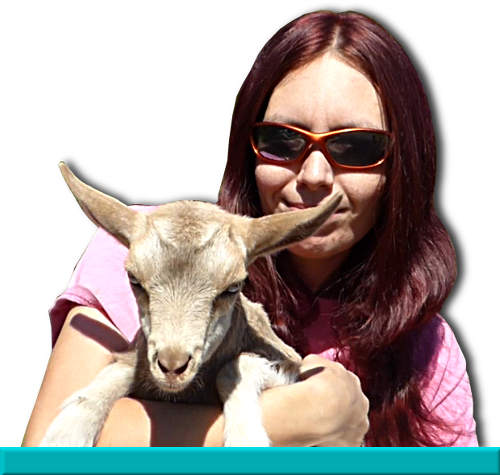 February’s Goat of the Month is the fabulous Honey Doe Farm Hatsumi. By the CCF5 William the Conqueror and out of Honey Doe Farm Nutmeg, this beautiful golden doe is one of the sturdy well bred foundation does of the K-N-S Farm and Honey Doe Farm lines. Distinguished by the splash of white alongside her muzzle, Hatsumi is a favorite from her year and has proven herself an excellent mother and an even better milker. With a strong attachment, good medial, and well placed teats, she is very easy to milk. Although a little meatier than I like, her capacity is excellent, and her orifices are plenty wide. Her biggest flaw, like many of our foundation does, is a pocket in the front of the udder. Hatsumi has produced fabulous does including Honey Doe Farm Paprika and the upcoming Honey Doe Farm Pixel Art. One that tends to kid out triplets at minimum, she has carried, delivered, and nursed quads very successfully as well. Paprika came from that set of kids, actually. What’s more, Hatsumi is one of those does who can be bonded and trusted with an orphan kid, if care is taken. This year she is assisting in the feeding of several kids that don’t belong to her, including the one pictured! I cannot recall a single time where Hatsumi was ill, or had issues with foot or skin infection. These are the type of does I covet, as everyone should. Completely reliable on the milk stand, with a very calm gentle personality. I will admit she is not as people-oriented as I would prefer, but she gives up and allows herself to be caught without fuss, and never misses a milking time. Strong and sturdy in body, Hatsumi really embodies the heavier cobby style of the Nigerian Dwarf, a great deal of substance with a deep chest and girth; plenty of room for heart, lungs, rumen, and all the other important bits. Thanks to her very laid back personality and hardiness, there are few stories to tell about Hatsumi! Which in the end, is not a bad thing in the least. The quiet trouble-free does may not always get the front page of the farm news, but they are the backbone of the dairy. Previous Previous post: What’s the least you can do?